ForkLift is an interesting application that integrates several functions. On the one hand, it is a useful folder and file manager, and on the other, a quick FTP/SFTP client. 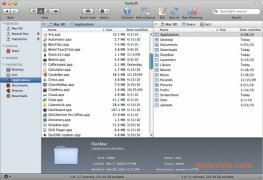 With an interface that's very similar to that of the Mac's Finder, it combines two panels from which you can view your files and those that you have on the server. 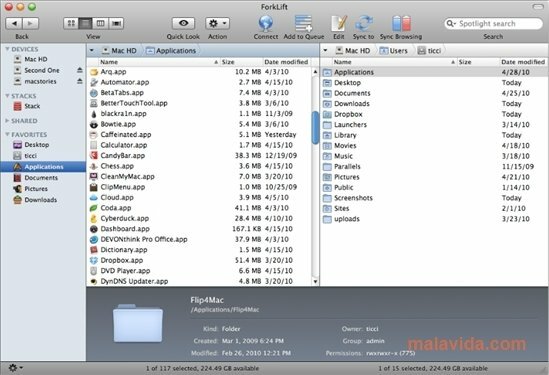 With those tools you'll be able to browse several folders and drives very easily, at the same time that it will allow you to carry out various actions with the files, like copy, rename or move. 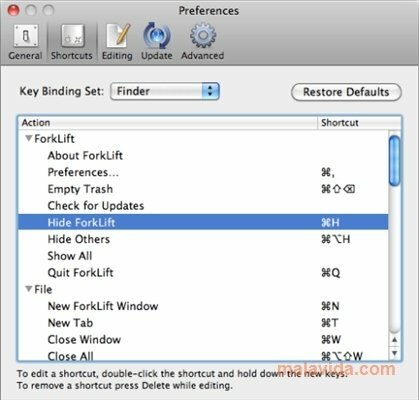 ForkLift will also allow you to open ZIP, RAR or TAR files, among others, or to complete full system searches. Furthermore, you can preview the files without any need to open them, and easily check their properties. ForkLift also allows you to connect to FTP, SFTP and Amazon S3 servers, and supports Bluetooth. You will be able to copy files to mobile devices, like the iPod or synchronize folders. Thanks to a clear and simple interface, the functionality of ForkLift is guaranteed. 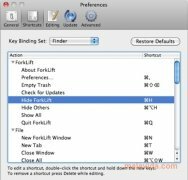 Try out ForkLift on your Mac and discover all its possibilities. The trial version has some limited functions. Only works on Snow Leopard.